The former owners of Cafe Piccolo try their hand at a fast-casual wine bar in Fremont, modeled after neighborhood spots in Italy known as enotecas. 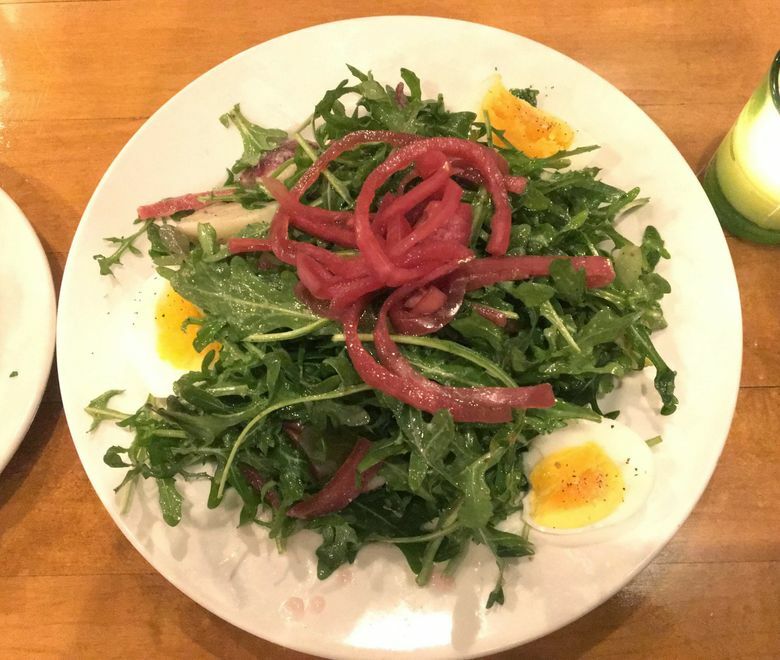 I was skeptical when I first walked into Esters Enoteca. After hearing that the owners of Maple Leaf’s Cafe Piccolo — which closed in 2016 — had opened a wine-and-tapas bar in busy Fremont, I’d organized a birthday dinner there for my husband and some friends. 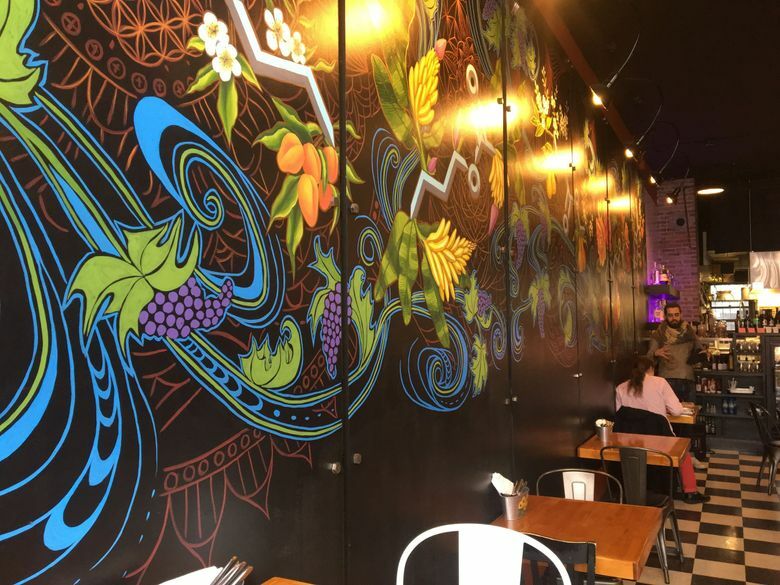 I liked the look of the space — candles on the tables; checked floor; a bright, botanical-themed mural dominating one wall — but I was surprised to find out it wasn’t a sit-down restaurant. Order at the counter? For a special night out? Two hours later, I was a believer. As the four of us sipped and ate our way through a progression of small plates of food and glasses of wine, the service felt attentive and friendly without interfering; tastes of wine offered, menu suggestions made. Sometimes we trooped up to the counter to order another glass of tempranillo or another plate of pan-seared Brussels sprouts with bacon and marsala or a cheese-and-salami plate. Sometimes, if our server happened to be delivering something else, they’d take our order at the table. The meal felt expansive, in the way the best meals do. This is exactly how Nick and Trish Carlino want their diners to feel. The couple ran Cafe Piccolo for 10 years, but while the Italian restaurant became a fixture for many northeast Seattle families, factors such as rising rents and labor costs made success elusive. When the building went up for sale, it “seemed like the perfect time,” Nick Carlino said, to explore a new concept. They looked around for models. They landed on an Italian idea — a fast-casual wine bar called an enoteca. In a trip to Italy, Nick Carlino had loved how approachable these neighborhood spots were. “You could just walk in and some guy was pouring wine and they would make these great little snacks,” said Carlino. Counter service was key to the concept, because it would both save on labor costs and — they hoped — work for the young, modern diner they were targeting. “People really like that we’re not at the table every five minutes,” said Carlino. 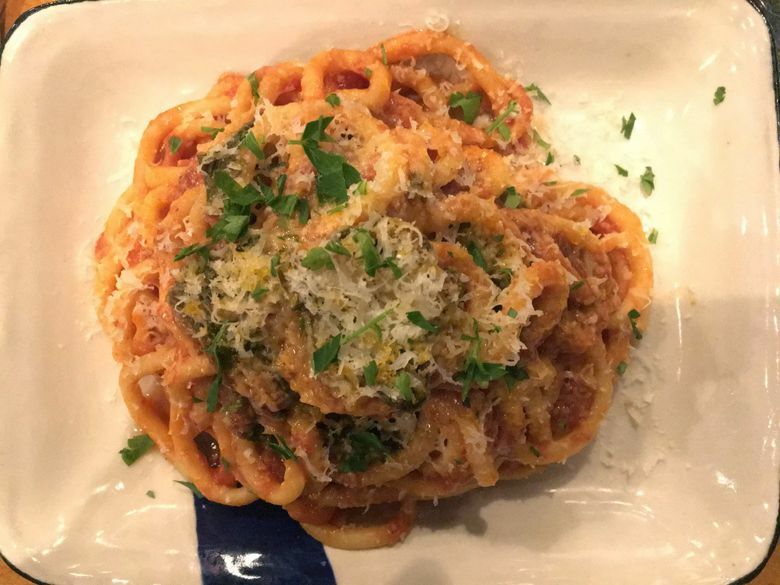 The plates: Esters uses Italian cooking techniques, but the menu of small plates, salads, bruschetta and pasta is wide-ranging, with many vegan and gluten-free options (including gluten-free pasta). Most dishes cost $10 or less; solid choices among the current selection include the crispy duck fingers ($10), delectably salty-sweet-crispy with just enough spice; a hearty, lightly dressed arugula salad that pops with pickled red onions, hard-boiled eggs and potatoes; and braised beef cheek poutine with home-smoked mozzarella and more pickled red onion ($12). There is a tasty pasta dish with tomato, garlic and just a hint of Calabrian chili ($10). The lunch menu stars a wide range of panini, stuffed with everything from jerked jackfruit or bacon-and-egg to crispy-tofu-and-yam. We’ve had a few disappointments — the promising-sounding golden beet bruschetta was strangely bland, and a kale Caesar with tasty bits of spiced walnuts had delicious flavor but was overdressed (my solution: I took it home and added greens) — but overall the freshness and flavor of the dishes has impressed. 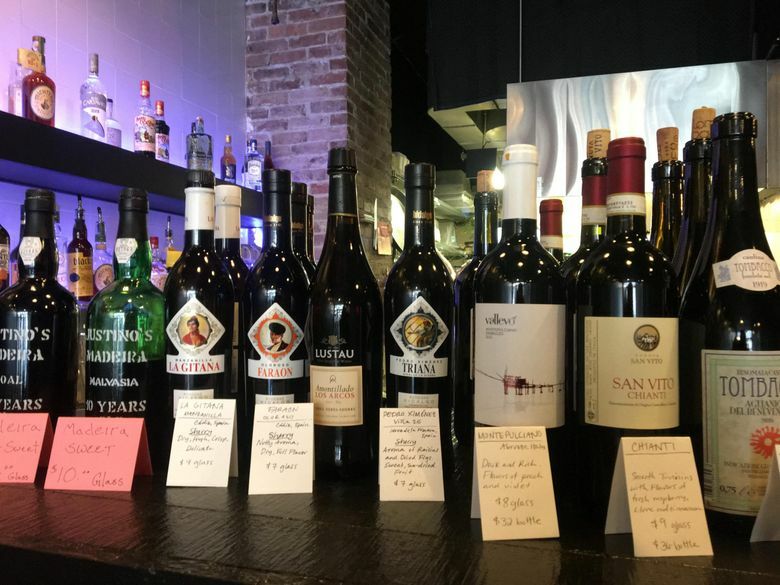 The pours: When it opened, Esters served six wines by the glass and are up to 20 varieties now. The focus has been on Italian wine, but they’re branching out to include wines from other regions. The bar menu also includes a range of beer, cocktails and homemade sodas and phosphates. 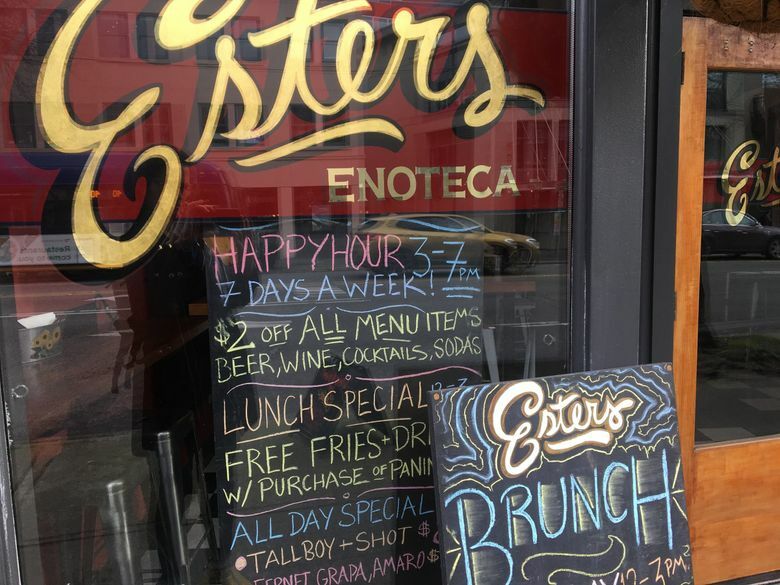 Paella for all: Esters has a generous happy hour, from 3-7 p.m. daily, with $2 off all dishes, wine and beer. Even better: On Thursday nights, you get a free small plate of chorizo-and-seafood paella for every order of wine, beer, cocktail or homemade soda. What you’ll spend: If you eat during the generous happy-hour window (3-7 p.m. daily, $2 off all plates and wine and beer), $50 (pre-tip) will get you four small plates and a couple of glasses of wine or beer and possibly even dessert. After 7 p.m. you can mix and match three or four of the lower-priced small plates, or two of the larger plates (eg, kale Caesar, fish and chips) or generously sized panini, plus two glasses of wine, before you hit that bar. And don’t forget that free paella on Thursdays. The panna cotta: The dessert list currently has just two items (each $7). The zeppole is a bag of fresh-made doughnuts — small, warm and tender morsels that you’ll devour in minutes. The coconut panna cotta, creamy-smooth and not-too-sweet, is best savored slowly. The art: The Carlinos hope to become a staple of the Fremont arts scene, with occasional live music and art shows. Plans are in the works for “open-screen” nights where fledgling moviemakers can share their work. Not surprisingly, perhaps, for a wine bar that aims to feel homey, Esters is a family affair. The Carlinos’ older son Dylan, formerly at Cantinetta, is now a sous chef at Esters. Their other son, high-school age, washes dishes on Friday and Saturday nights. It is a small space (the table count is four tables for two, two tables for four, a tall table that seats eight and a couple of counters) so it will be interesting to see how the counter-service model works once the restaurant becomes busier (on the nights I went, the restaurant was lively but never crowded, with no counter lines). Carlino’s not worried.